﻿Grand Rapids Tree Service﻿ has some of the finest tree experts in West Michigan, a group of guys that can handle any tree projects out there. We care about customer satisfaction like no other. We work efficiently & clean. The owner's father began his tree service company in 1962, so he grew up learning about climbing trees and cutting them. 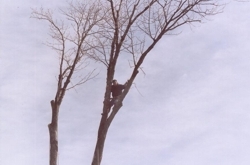 As a kid he used to help his father with all the tasks for tree removals in Grand Rapids. It's safe today we come from very knowledgeable backgrounds with deep appreciation for what we do, and a sense of duty to fulfill the best tree service possible in loving foot steps of owner's father. We have been taking care of Grand Rapids community for many years with excellent customer feedback and we plan to continue for 20 more years. With many long term clients and word of mouth referrals we were able to grow our business so everyday we are thankful to this community and work hard to give you the best tree service at the most affordable prices. We guarantee 100% customer satisfaction, as we are tree care company with integrity, putting our pride on the line every job and the owner also gets involved for every job as well. We love doing our job as tree surgeons and tree doctors! We're simple guys that love to be in T-Shirt & Jeans & working out doors. We spent our whole lives climbing and on top of various types of tree in West Michigan. We have deep appreciation for the arbors in this area and provide services to not only remove but save & restore trees if they are sick and need to be rescued. We know exactly how to trim trees without causing irreversible harm to them, we also understand how to nurture & care for them by deep root injections or other techniques to in increase nutrients & reduce infection.